Le Clos du Papoune is a self-catering holiday rental in the Drôme provencale, more precisely in Nyons. The village Nyons is also called «Le Petit Nice» due to the same sunning rate as the mediterranean city Nice. Nyons is located in the Drôme Provençale and has been labeled as «station climatique» due to its micro-climat isolated from the Mistral. Thus this holiday rental offers the perfect conditions for a relaxing holiday in the French Provence. As Nyons is situated on the border between the Drôme and the Provence, this holiday rental is the perfect starting point for discovering the South of France. Le Clos du Papoune is a very comfortable holiday rental in Nyons with up to 6-8 sleepings. This holiday rental in the Drôme provencale is equipped with a private heated pool, free internet/WiFi, barbecue and television (including English providers). While there are no superb views, thanks to the ideal situation of the holiday rental you will be able to enjoy the commodities of the village of Nyons (Drôme - Provence), while still having your full privacy and staying in a very calm area of Nyons. Indeed, this holiday rental in the Drôme Provencale is situated in a very calm dead end street at 200 m of the coöperative of Nyons (cooperative visible from some parts of the garden, but not from the pool-area). The garden of the holiday rental is completely enclosed, thereby further ensuring your privacy and prohibiting any view from the street into the house or the garden. Next to the holiday rental there is a safe parkingplace for your car. All in all, perfect conditions for splendid holidays in the Provence ! End of stay household (optional): 110 euros. Standard opening time private pool: 1/5 up to 30/9. In 2014, 2015, 2016 and 2017 the pool was opened from 1/4 until 1/11. * In the months January, February, March, April, May, June, September, October, November, December a financial participation to the heating expenses is required: this will be done with the electric meter (0.19 euro/kWh price 1.1.2018). Thanks for your understanding. The household will have to be made at the end of your stay in the holiday rental. “Rien à redire tout était parfait comme d'habitude et c'est avec un immense plaisir que nous reviendrons l'année prochaine aussi à l'ascension. Je me permettrai de revenir vers vous en fin d'année pour la réservation"
— Patrick M. From Switserland (may 2018). Nous passons un séjour formidable! You have simply been marvelous. A private heated pool is at your disposal in the holiday rental in Nyons. Lounge chairs for comfortable sunbathing are waiting for you in the technical room. The outside shower permits a refreshing rinse without the need to enter the villa. The situation of the private swimming pool provides maximal privacy fully isolated from neighbors or people on the street. From experience we can say that the orientation is ideal, and that the heated pool is nicely protected from any wind allowing to enjoy the sun, even in the winter. The spacious kitchen of this holiday letting in Nyons is fully equipped (electric oven, microwave, dishwasher, fridge, electric hob and hobs on gas, coffee maker, kettle, toaster, food processor, mixer, ... ). There is a separate dining area with seating for 10 persons in this holiday rental. Via 2 french doors you have direct access to the covered terrace of the holiday home with built-in barbecue. You can thus enjoy your vacation in the Drôme Provençale in all weather conditions. In the main living area of the villa rental there is a chimney (not permitted to use) and 2 sofas. Internet WiFi and cable television are freely available (approximately 50 international chains, including EN). In addition there is also a DVD and CD-player as well as some DVDs, both for adults and children. In the library of the holiday letting you'll also find plenty of tourism books to help you plan your outings in Nyons and the Drôme Provençale. The yellow room of the provençal holiday rental in Nyons is the first bedroom. This bedroom with parquet floor is equipped with 2 beds 90x200. The bedroom has direct access to it own terrace, via its own seating area, from which you can access the private heated pool immediately via steps down to the private swimming pool of 10x5m. This first bedroom is very bright thanks to its location on the South and climatisation is available in the seating area. You can thus optimally enjoy the famous light for which the painters love the Provence. The blue room is the second bedroom of this holiday letting in Nyons. It has views to the private heated swimming pool and has the possibility to accommodate 2 separate beds (90x200). This bedroom is situated on the ground floor of the villa and does not become too warm in the summer when the temperatures outside are very hot. 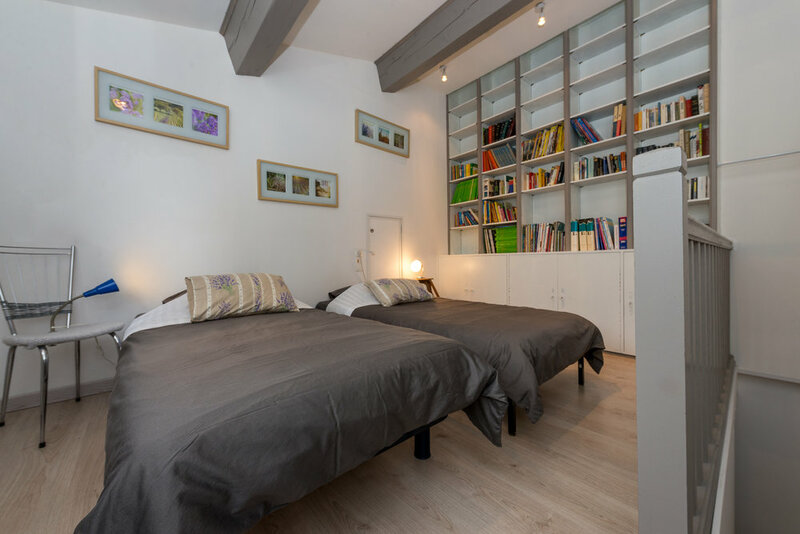 Thanks to the large built-in wardrobes throughout the holiday rental there is sufficient space in this holiday home for all luggage during your holidays in the Drôme provençale. The Turret room is the quietest bedroom of this holiday letting in Nyons. This bedroom accessible via a staircase. A vast library (with Dutch, English and French books for all ages) furnishes one wall. The views over beautiful pines and in the distance the cemetery of Nyons guarantees peace ! This bedroom of the holiday rental has 2 separate beds. Thanks to its situation, this room is ideal for the afternoon nap of the baby. The other family members can still play e.g. in the private heated swimming pool of the holiday letting without fear to wake up their little brother or sister. Thus your stay in the Provence will be relaxing and enjoyable for the whole family ! Next to the kitchen of the villa is a covered terrace with built-in barbecue (with chimney so as not to be bothered by the smoke) and garden furniture. It is the ideal place for your breakfast, lunches and dinners. This terrace is running by in the terrace in front of the living room. A beautiful sunny spot where you can sunbathe without patter of the private heated swimming pool. Would you prefer to relax in the shade ? This is also possible, for example, in the hammock, under the pine trees. In short, everything is provided to ensure that you can enjoy a relaxing holiday in this holiday rental in Nyons (Drôme Provençale). There are two bathrooms and one guesttoilet in this holiday rental in Nyons. The first bathroom on the ground floor is equipped with a sink, shower, toilet and washing machine. The second bathroom is on the lower level and includes 1 shower, the toilet and 1 sink. There is also a guest toilet at the entrance of the villa in Nyons (Drôme, Provence), under the staircases leading to the turret. Your vacation getaway to the Drôme provençale is waiting.